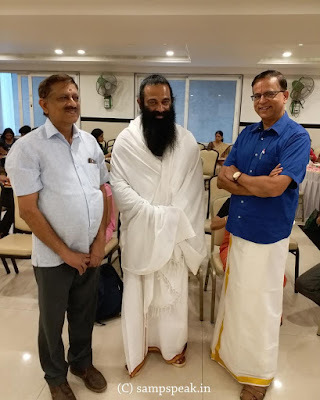 "Sampath Speaking" - the thoughts of an Insurer from Thiruvallikkeni: Acharya Rakum ji ~ caring for the blind ..
Sunday, 24th Mar 2019, at Bangalore attending betrothal of the daughter of a close friend, happened to see this Guruji like person (somewhat resembling Sri Sri Ravishankar with his beard !) ~ he was given some special attention. Went closer, enquired about him, immediately reverred him, bowed before him .. great person ! Bright Victory is a 1951 American drama romance war film directed by Mark Robson starring Arthur Kennedy and Peggy Dow. During World War II, Larry Nevins, an American sergeant, is blinded by a German sniper while fighting in North Africa. He is taken to a Pennsylvania hospital for other blinded soldiers, where he struggles to accept and come to terms with his disability. Most likely you would have seen ‘Raja Paarvai’ (lit. The Royal Gaze) 1981 Tamil- film directed by Singeetham Srinivasa Rao. Loosely based on the 1972 film Butterflies Are Free, it had Kamal and Madhavi – and beautiful melodies of Illayaraja. In movies, disabilities are vividly portrayed, in reality, it would be too difficult ..
Milton's eyesight had been steadily declining for years, most likely the result of untreated glaucoma. By 1652, he had gone completely blind. At a time before Braille, recorded books or any of the technologies that assist visually impaired people today, blindness was like an intellectual death sentence. Milton was determined not to let that happen. He dictated his business correspondence to a transcriber for as long as he could, and insisted that his daughters read to him. Milton composed a poem to explain his feelings. .. years he was to recover the lost Paradise too !! Acharya Sri Rakum School for the Blind is a Free Residential School for the Visually Impaired and for the Sighted-under privileged was started in 1998. The school starts from Nursery and goes up to the Postgraduate level, preparing the students to face competitive entrance exams like the Civil services and take up jobs and be mainstreamed in society. The School believes in an integrated approach where both blind and sighted children study and grow up together. The training imparted includes reading and writing through Braille and mobility training for totally blind children. The children are educated and go through the regular school curriculum and also learn Carnatic music, Bharatanatyam, sports, yoga, karate, singing, cooking and abacus. Vocational skills are also important and we endeavor to build the children’s social skills and confidence. There are three branches in Bangalore located at Indiranagar, Devanahalli and Arkavathy Layout. The total strength of the school is about 800 students. All facilities offered by the school are free and the school meets its expenses from contributions and donations from well-wishing people. 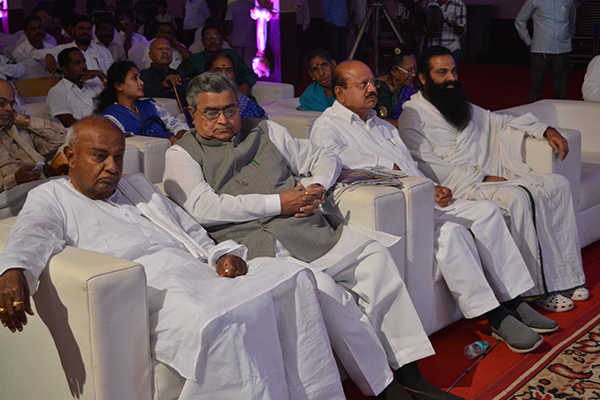 The founder (seen at the function), Acharya Rakum ji, is a familiar face in Bangalore, helping and supporting needy. He himself had ordinary beginnings but had the motivation flowing from his young age. It is known that he was an athlete and a long distance runner during his school days, became a football player, also playing volleyball and more sports. 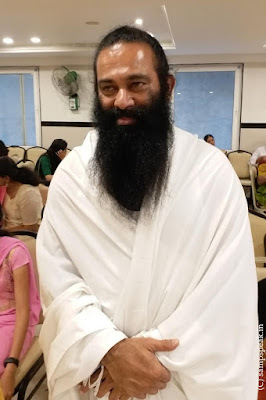 He was to learn Judo, Aikido, Kungfu, kalari, stick-fighting .. .. he became a certified Yoga teacher too, a black belt and branch chief of International Karate organization. He went on to learn more internationally, learning Tea ceremony (o Cha) and Ikebana and also practiced kick boxing in Manchester, England. In 1982, while teaching kids contracted with Polio, Rakum ji discovered the effect of a treatment without medicine and a medicine without treatment. This method had helped a lot of polio affected kids and it received massive media attention. Seeing the need that children with disabilities faced, he began the school with a handful of students at Indiranagar. In 1984, after participating in the South-East Asia meet in Jakarta, Indonesia, with much confidence he inaugurated centres in Bangalore, Pondicherry and Hyderabad. After much expansion, in 1987 Rakum ji felt the need for an organised entity and then registered a charitable trust under the name "Ma Jagat Abhyasa Samudra Kendra's". In 1993, he registered another trust called," Temple of fighting no arts". The Govt. granted an 80G Tax Exemption status and continued it with the “Sri Rakum School for the Blind”. The children are provided with education, physical activities, like yoga, karate, games, nutritious food, clothing, and shelter. Acharya Rakum shares his values that help the children grow in the society. His teachings are taken from the various philosophies and texts of Indian origin. He uses the Zen Philosophy and the Zen style of teaching, sharing and inculcating values through stories and a lifestyle that he has demonstrated and can be followed. There are people who often criticize others and enjoy a life not worthy of living, then there are people like Rakum ji, whose life is worth emulating and adoring.